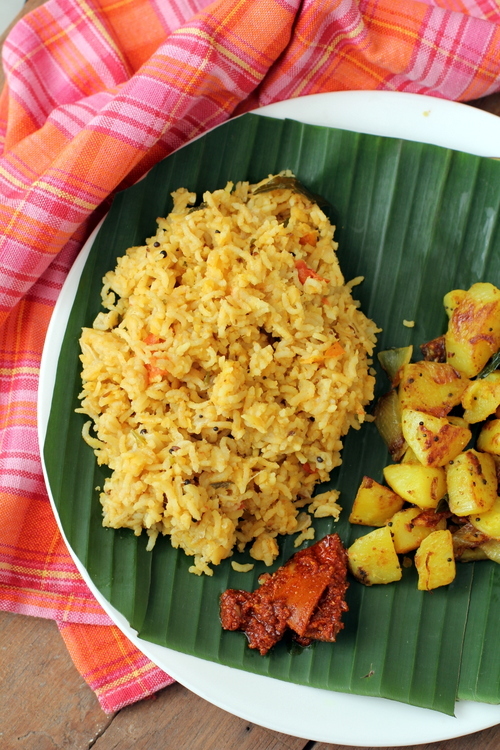 There are endless variety of rice dishes in Indian cuisine as rice is a staple across the sub continent. The varitions, flavors, textures of each rice dish is unique, be it the rich Biryani or the simple lemon rice. 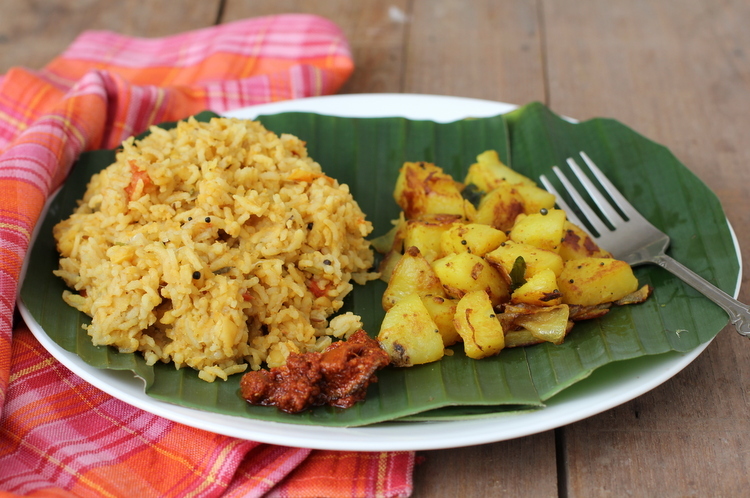 One such simple, protein dish is a South Indian style tur dal rice variety, Arisi Paruppu Sadam. When I am rushed for time with less than 30 minutes to cook a complete meal, my go to one pot meal is dal rice. Comfort food! 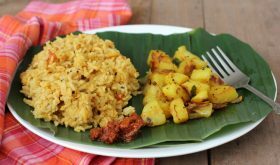 A straight forward recipe with its origins in Tamil Nadu, Arisi Paruppu Sadam has short grained rice and tur dal as its star players. Tempering of spices in ghee aka clarified butter and the use of asafoetida elevate the flavor of the rice dish tremendously. I have tried this recipe with asafoetida and sambar powder and it was relished by my family. Today, am posting a variation which has crushed garlic along with aromatic spices like cinnamon and cloves in the tempering. I loved the flavors and it made for a hearty and filling meal. To go with Arisi Paruppu Sadam, I also prepared a simple potato fry which makes for a perfect accompaniment along with papad, pickle and curd. Heat oil and ghee in a pressure cooker. Once the oil+ghee turns hot, add mustard seeds and allow to splutter. Add cumin seeds, crushed garlic, red chilis, cinnamon, cloves and curry leaves and saute for 15-20 secs on medium flame. Add chopped onions and green chilies and saute for 5 mts. Add turmeric powder and salt and mix well. Add chopped tomatoes and saute for 5 mts. Add the drained rice and dal and saute for 2 mts. Add half of the chopped coriander leaves and mix well. Add 4 cups of water and place lid. Pressure cook upto 3 whistles and turn off flame. Once the pressure reduces, remove lid and mix well. Remove to a serving bowl, garnish with chopped coriander leaves and serve warm with papad and potato fry. Garlic can be omitted and 1/4 tsp of asafoetida can be used in its place during tempering process. A heaped tsp of sambar powder can be added at Step 3. A tsp of coriander powder can also be added. For a mushy rice, add 5 cups of water. Mixed vegetables like potato, peas, carrot, beans and beetroot can also be added after sauteing the onions and before adding the tomatoes. Looks great! Dal chawal is always a fave. I would make it with a gobi fry instead. Potatoes and rice wouldn’t be good for diabetics, the body would convert it quickly right to sugar, which raises insulin and fat storage. A lower sugar/simple carb sub would be best: Cauliflower, cabbage, green bean, carrot, squash. etc. Cook for 10-12 mts in a pressure cooker. can I make ahead of time and freeze this rice ? Can I send it as in kids lunch box ? Does it tastes good even when it is not warm ?